Panda Express serves addictive Chinese food, especially Orange Chicken. But going to eat can be frustrating especially at busy lunch and dinner times. With so many delicious options, customers hem and haw when it comes time to order. What to order? What to order? What to order? What to order? This is terrible if you only have a few minutes to get lunch and get back to work or on to your evening errands. Ordering ahead from the web or the mobile app is a great solution. In our experience, the service works great. We've ordered ahead and then just see the cashier to get our food, hot and ready to go. Many times, the workers stop helping customers in line to immediately prepare our food. We've even ordered ahead and then eaten inside the restaurant. Try it the next time you want Panda Express but don't want to wait. The iPhone app is available HERE and the Android version HERE. 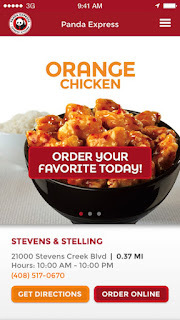 Panda Express is online at: www.pandaexpress.com.